Files with bds file extension can be typically found as Cadcorp SIS base dataset files. Most likely program specific file type. What is bds file? How to open bds files? The bds file extension is associated with the Cadcorp Map Manager, a tool for preparing, configuring, and managing both spatial data and metadata for the web, desktop etc. The bds file contains base dataset. 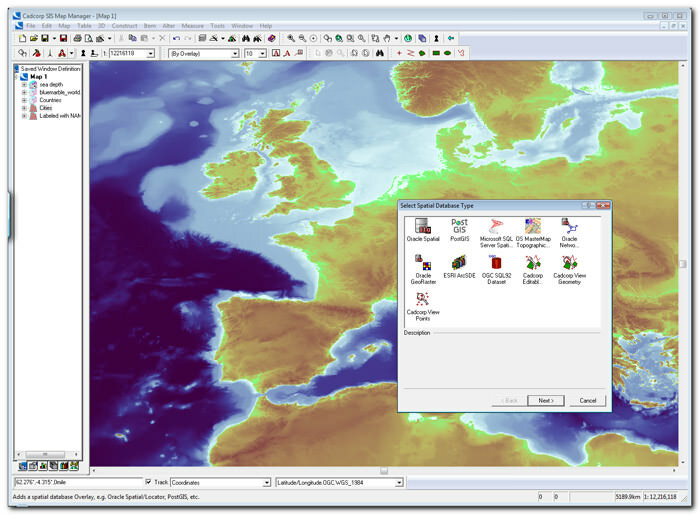 Map Manager is used for preparing, configuring and managing both spatial data and metadata for the web, desktop, and spatial database. As far as we know, these datasets are only useable in Cadcorp Map Manager. If any program can export or convert .bds files, it would be the original Cadcorp Map Manager. and possible program actions that can be done with the file: like open bds file, edit bds file, convert bds file, view bds file, play bds file etc. (if exist software for corresponding action in File-Extensions.org's database). Click on the tab below to simply browse between the application actions, to quickly get a list of recommended software, which is able to perform the specified software action, such as opening, editing or converting bds files. Programs supporting the exension bds on the main platforms Windows, Mac, Linux or mobile. Click on the link to get more information about Cadcorp Map Manager for open bds file action. Programs supporting the exension bds on the main platforms Windows, Mac, Linux or mobile. Click on the link to get more information about Cadcorp Map Manager for edit bds file action. Programs supporting the exension bds on the main platforms Windows, Mac, Linux or mobile. Click on the link to get more information about Cadcorp Map Manager for create bds file action.